Lollipops aren’t just for kids. These edible gold-filled treats offer a grownup take on the classic candy. Who says lollipops are just for kids? These raspberry-flavored confections offer a grownup take on the classic candy. Each pretty pop is filled with edible 24k gold leaf, making them delicious gifts for discerning sweet tooths, unique favors for bridal or baby showers, and spot-on treats for 50th wedding anniversary parties. (Or any wedding or anniversary party, really. They can all be golden years!) Handmade in Clarendon Hills, Illinois. Each Lollipop: 4.5" H x 1.25" Dia. 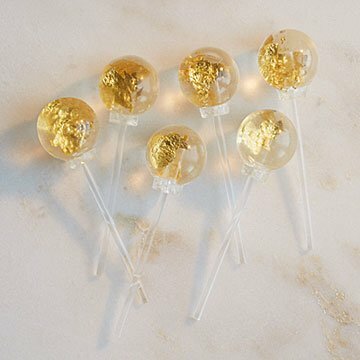 Lollipops are made with edible 24k gold. The gold leaf pieces in the middle of the lollipop scratched the roof of our mouths as well as our tongues. However, the clear part of the lolly was quite a strong raspberry flavor and very delicious. I would buy this again and recommend to others. A great gift for the person who has it all.